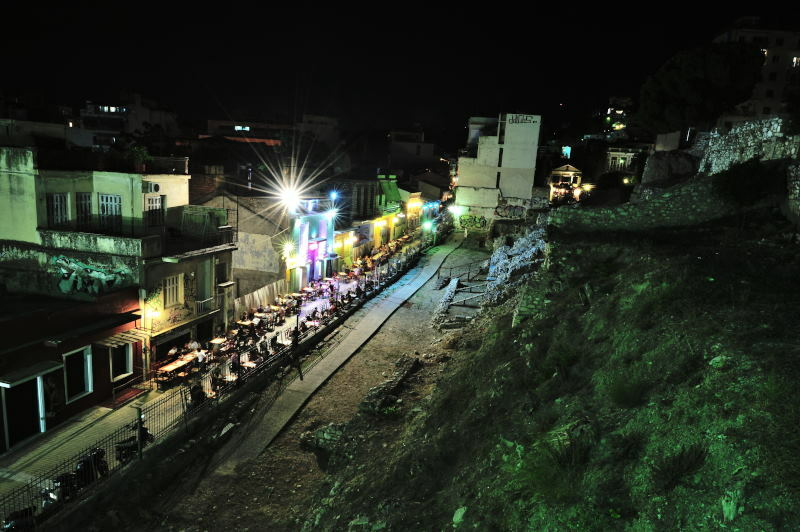 Lights are lit in Mouresi village. 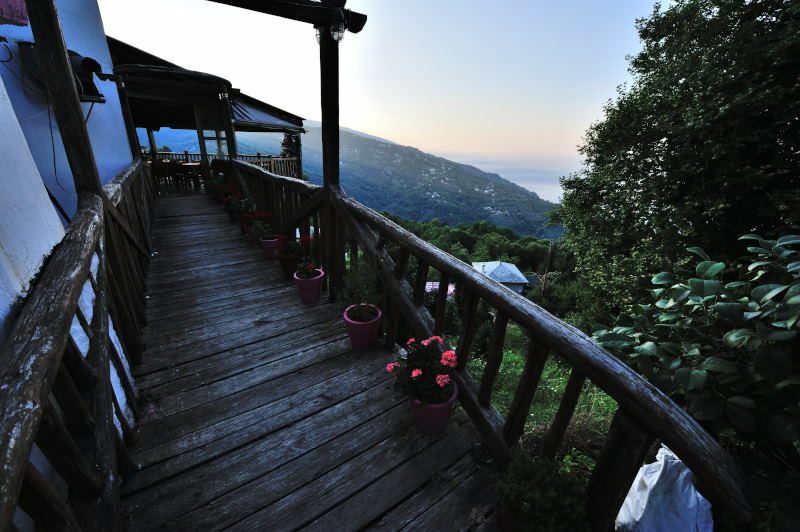 Hills of Pelion shine in the serene darkness of summer. Here and there people`s laughter and dog bark join the quiet cicada song, just to remind everyone present that this is a place full of life. Maybe currently peaceful, maybe dark, but at the same time full of warm Greek blood that will pulsate again loudly as soon as the morning comes! Yet, the morning can wait. Fresh air. Curves of the village road, going upwards and passing the old houseyards. Lights in the windows shine out all the beauty of families gathered together under the same roof, enjoying one more good summer night and collecting all the good that can be used in the days to come. Some are sitting at the balcony, sipping probably one of those tasty homemade drinks and vividly commenting something. If they see someone rare walking on the road under a street lamp, all eyes are checking who this might be. No matter of the finding whether it is someone known or a stranger, unavoidable, friendly “Kalispera!” is exchanged between the road and the balcony. Night swimming in the local swimming pool. 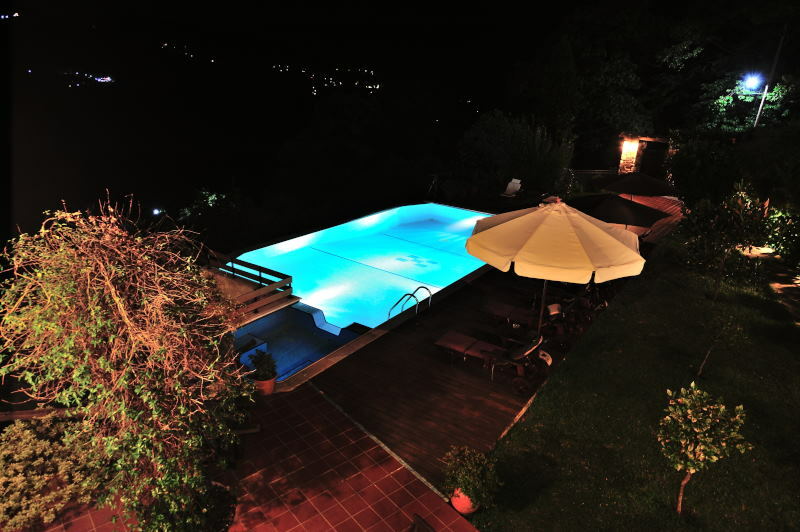 Cicada song, fresh air, peacefulness…enough to wish that this night lasts for at least a couple of long summer months! After a few hours, however, the sun is unmistakably out again, sending its best warm greetings. Air conditioning is on as the car rolls down the mounting road, passing stone houses, neat and colourful courtyards, people, animals (!goats on the road), trees and fruit yards, parked cars with tires covered by cardboard and windshields with aluminium cover on top of them. The dusty road is bathing in the warm sunshine, while continuing further along the coast, in curves. Sometimes it ends up in a forest, according to a confused GPS. Or goes around the hill, turning into a walking (hiking?) path, it goes up and down and down again, and it gets so steep that those driving lighter car need to catch some breath. What is waiting down there? End of the road? Some steep stairs? In that case, how to go back?? And it is so narrow, that just a small move to the side might leave a scratch on the car. You really do not want to have a scratch on a rented car. Phew, managed to get out of the narrow road jungle! The car can be parked safely close to the beautiful Mylopotamos Beach. The local bar promises best beach cocktails and light summer lunch. The crowd on the beach is growing constantly, until all the best and next best towel places are taken. The swimmers are swimming, the divers are diving, the snorkelers are snorkeling and the brave ones are jumping off the tall rock nearby. The water, warm, clean and beautiful, is carrying away all the fatigue and stress leftovers from the past working season and everything feels balanced and in place again. Some salty water is dripping from the shoulders down to the pages of this summer`s “vacation book”, while the people on the neighboring towels are probably discussing about the best word to fit into a puzzle. People do deserve this kind of “life problems” a couple of days in a year. Whoever decides about it: let them have that. Speaking of the Higher Power, as the road turns westwards and more inland, the air gets cooler and somehow mystical. The highway stretches ahead, passing modern solar panel farms and soon magnificent rock formations can be seen in the horizon. 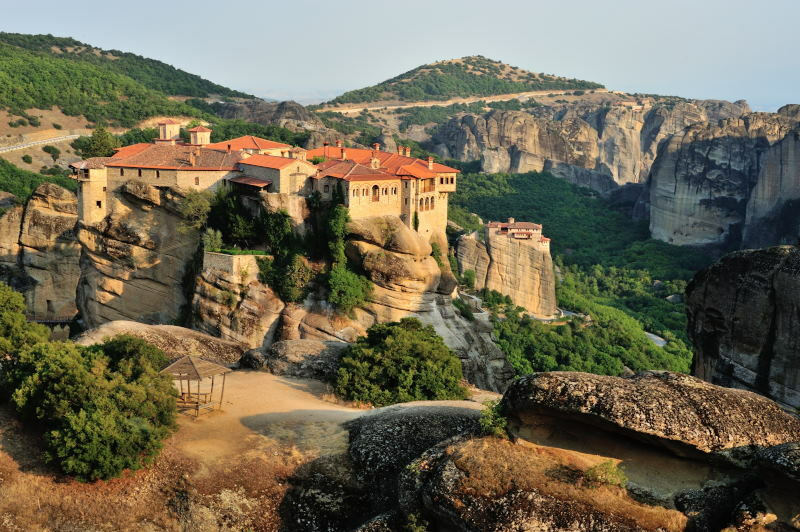 There are some that have only heard before of the Meteora rocks governing the central Greece. Now they can be seen in the distance and people are right; they do look like part of some Sci-Fi landscape! Entering a small town, it is just enough to look through the window and up (if not driving!) and lose breath – surrounding stone masses and colourful shades that spread all over their surface, feel like they are constantly watching everyone around. 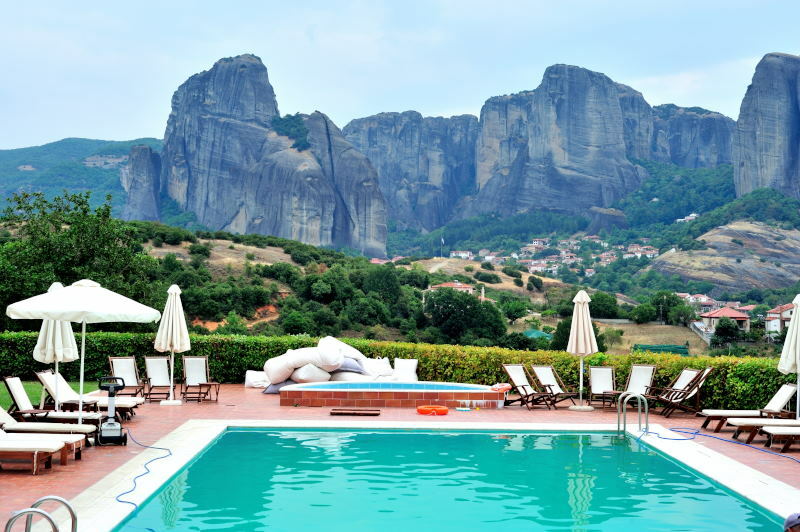 Numerous holes, all-seeing eyes, seem to keep the area safe and there is a sense of both leisureness and serenity at the foot of Meteora. 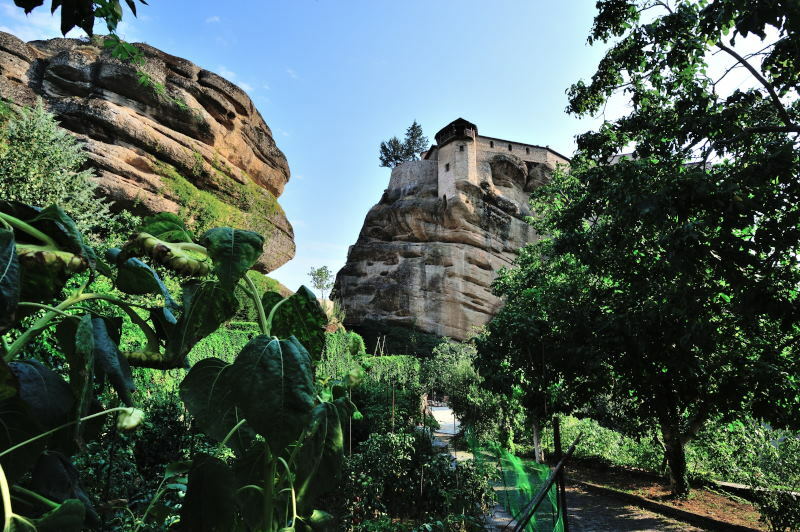 In six out of 24 monasteries that are still active, monks and nuns live their peaceful lives. In a female monastery, nuns sell herbs and honey, that are said to heal or at least help with different types of pain. In one of the inner courtyards, two workers are cutting a big piece of glass, working on the maintenance of the building. They are standing in the middle of a very tidy flower garden. Thousands of visitors climb daily thousands of steps, breathing heavily in fresh mountain air and marveling the surroundings. Back in the village, after getting more insight from visiting the rocky giants, the monasteries awake feelings of respect on a much deeper level. The people that live there and devote their lives to keeping the place alive in the modern times today deserve that respect. The next day starts with a good breakfast in one of the local bakeries that sell fantastic pastries, joined with a cup of black Greek coffee. 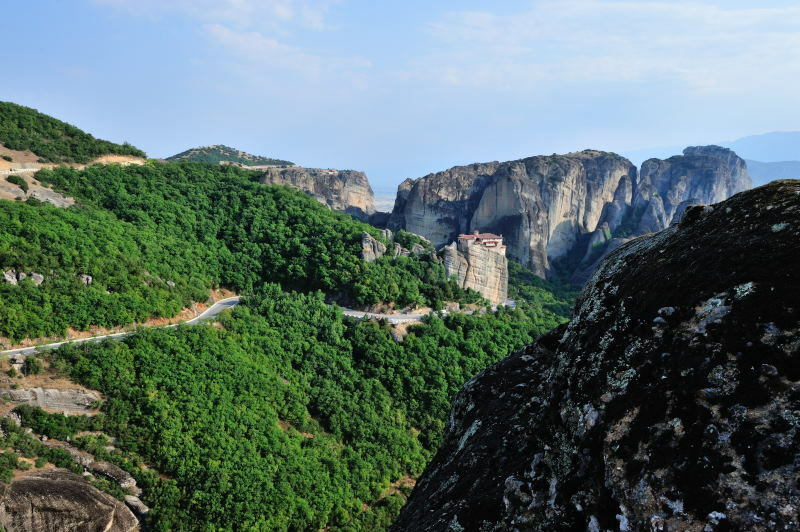 Some guides suggest visiting the Theopetra cave outside the Meteora village. The area witnesses prehistoric settlements between 5000 and up to 50 000 years ago! It is good if this is one of those days when the cave is open to the public, since it takes a longer countryside road to get there. 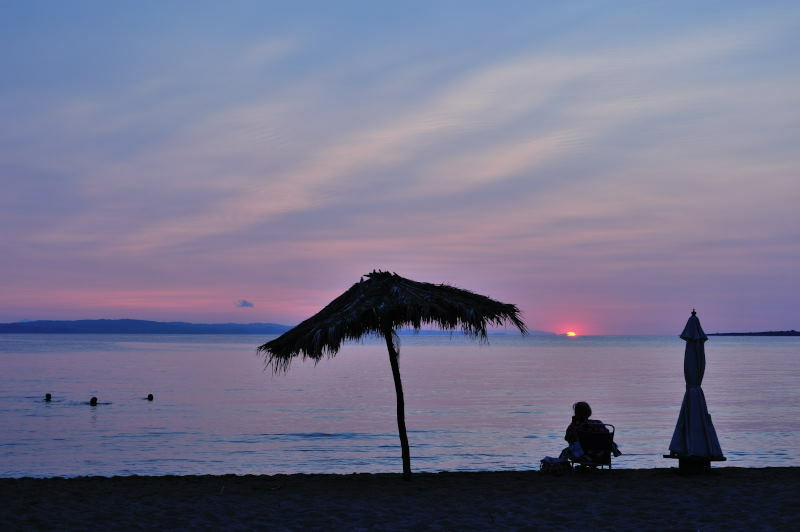 Some people in search for fun head for the small town of Paralia at the east coast. People, music, beach equipment and discounted winter jackets – all of that gathered in the walking street that is bathing in the afternoon sunshine. Two kilometers away, the popular Olympic Beach, is echoing the sound of badminton rackets and volleyball players` cheering. Small queue is made before the “foot shower” to wash off the sand before stepping on the smooth concrete promenade. Music and swimming during the day and cocktails on beach sofas at night, as the beat of modern music travels over the sand and further towards the horizon. High temperature until late afternoon leads to late dinner in one of so many local tavernas. Friendly laugh is hovering over plates with giros and pancakes, accompanied with beer, wine, ouzo or metaxa. Not too far from Paralia, the road towards the hand-shaped Halkidiki penninsula goes through landscape, that changes from somewhat flat and dry coastline to green hills with fantastic view of the Aegean Sea. The hand`s first “finger” Kassandra, is popular with youth in quest of party vibes and best places to shoot summer “selfies”. Famous beach Kalithea is on the top of the list, which explains long queues of parked cars before even entering the beach area. 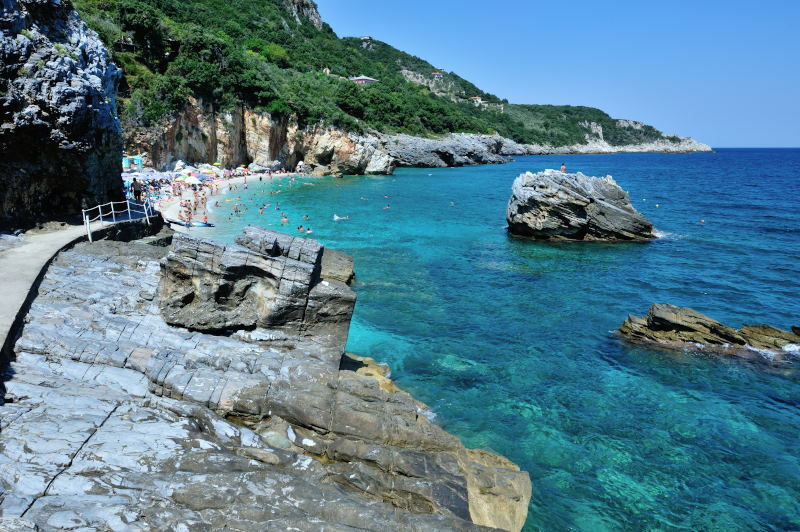 Sithonia, the second “finger”, on the other hand, is for nature-lovers and family members. Here wilderness rules, the deeper one wants to explore, and it is not rare to experience mountain goats stopping the whole traffic, as they take their time to savor that bush next to the road. In the cosy and ancient town of Toroni on the western coast, fishermen boats are gently swaying as the afternoon is slowly passing and sunrays are lightning the old fortress remains. This beautiful small town is full of colours, from paintings on the tree timbers to variations of the sea color, as it turns greener close to the coast and rocks. The beach stretches as far as the eye can see: from the fortress, via long lanes of hay parasols above the sunbeds, all the way to the restaurants corner a few kilometers further. Pedestrians over there often bump into waiters and waitresses, that are impatiently waiting to cross the street and serve hungry guests, since the kitchens are across the road of the serving tents. Nice smell of seafood, fish and grill is filling the night air. In the meantime, in Sarti on the opposite coast, warm colours of the town architecture invite for a cocktail at the beach or a cup of coffee at this cool bar/cafe. It is fun both to sit at the chairs in blue, red, yellow and see what it is like inside with all its exotic souvenirs from all over the world! And when the time for dinner arrives, it can be a little challenge to choose between different food style and many nice locations, since several restaurants have their dinner tables set up at the beach. Here, food queues can be seen both in the evenings (to get those sweet pancakes filled “with everything”) and at breakfast time, in front of the popular bakery. The weather is generally perfect – sunny, stable and warm. If it happens to rain, it does not last long and even summer rain storms are simply a refreshment, a break, before taking a leap into another sunshine-filled experience. Orange Beach on the Sithonia`s eastern coast can be a challenge if not arriving early enough, but lucky are those with smaller cars that can be put in the shade of cypress tree. One of the coolest places to be at this amazing place, is the forest above the beach through which several paths cross on the way to the sand and water. Numerous man-made tents and huts offer a nice resting and refreshing stop or even lodging for those that wish to stay longer. Athos, the third finger, differs greatly from Kassandra and Sithonia; spiritual peace and tranquility govern the whole area. 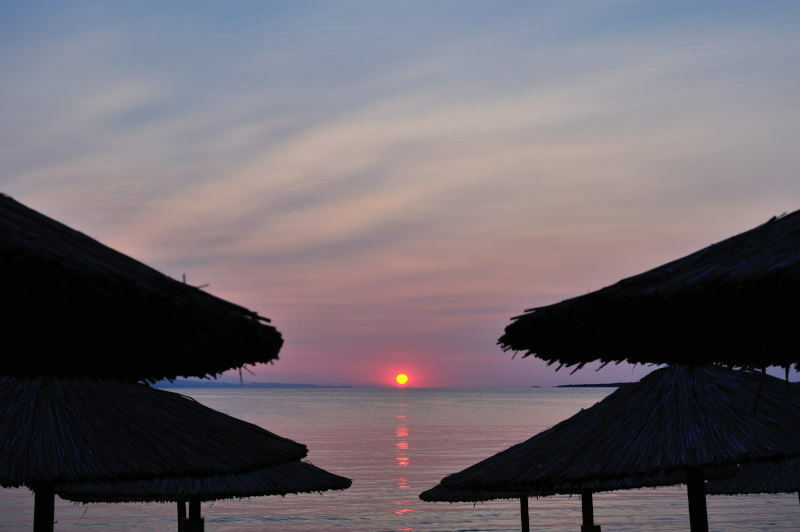 This part of Halkidiki is only partly accessible to female visitors, due to the strict religious rules. At the port of Ouranoupolis the big boat takes everyone onboard on a journey along the coast, where at 500 m distance, some of 20 orthodox monasteries can be seen. 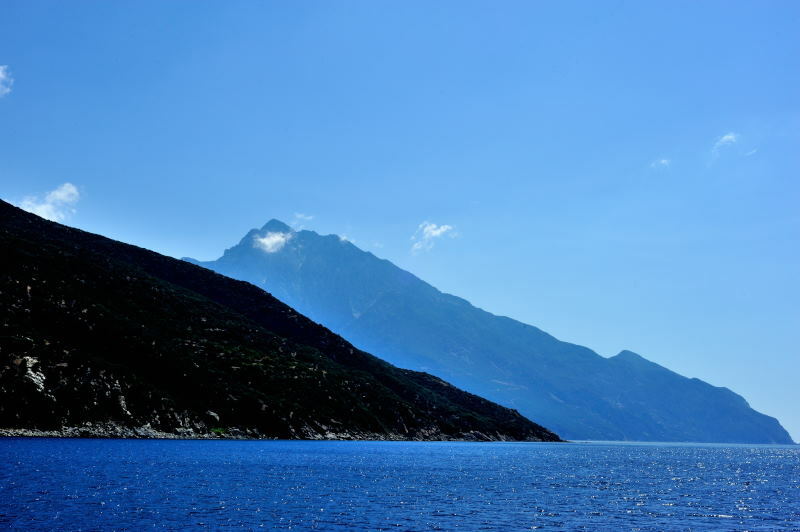 Above them all, rises its highness, “Holy Mountain”: Mount Athos. Back in the village, an evening walk up the local hill, passing vineyards and guarding dogs, will end up on a high plateau with a beautiful sunset at the horizon and the big mountain confirming its awesomeness, sometimes with clouds surrounding its peak. On the west coast of Greece, stone walls in red, blue, yellow and pink, one above the other, conceal narrow passages and roads in the unique and cosy Parga. 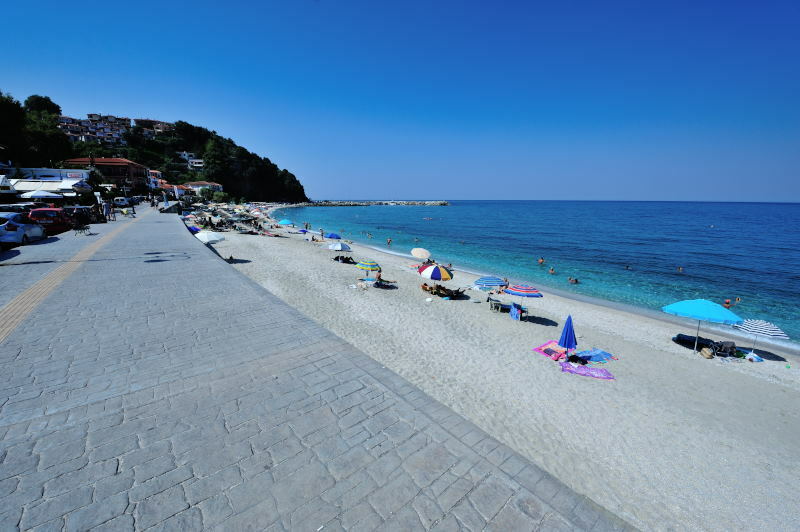 Spending 20 minutes in evening walk to the dinner place is a routine that people get used to after being in Parga for only 24 hours. Thousands of feet have passed the cobblestone paths and bridges that connect the hills and extremely busy downtown. When the evening lights are on and the nights sky starts showing brightest stars, local ferryboat takes people over the water, shortening the trip to shops, booths, restaurants and bars in the center. People of all ages remain awake and stroll at riviera until after midnight. 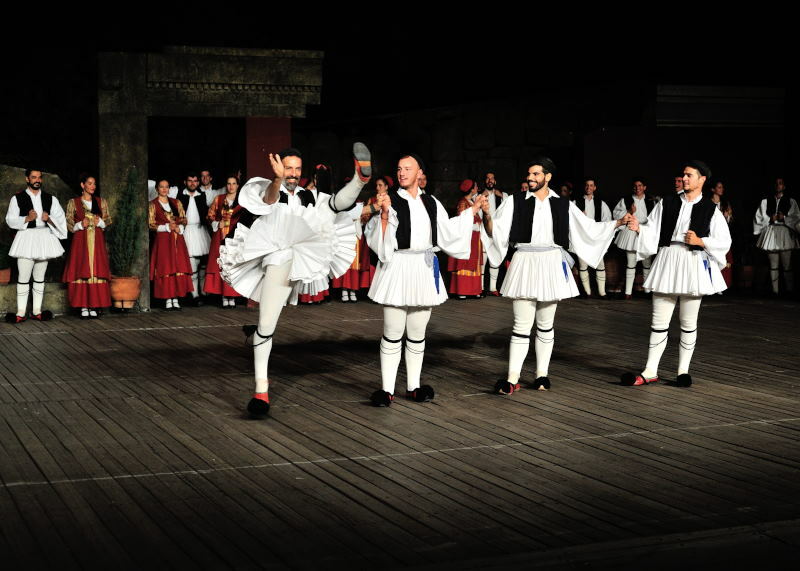 Several restaurants, next door to each other, play traditional Greek music and some of the owners raise their hands and demonstrate sirtaki dance to their guests. Further away, in the shopping area, extremely narrow, steep and winding stone paths lead the crowd up and down the busy alleys, full of clothes, jewellery, souvenirs, roasted corn and cotton candy. 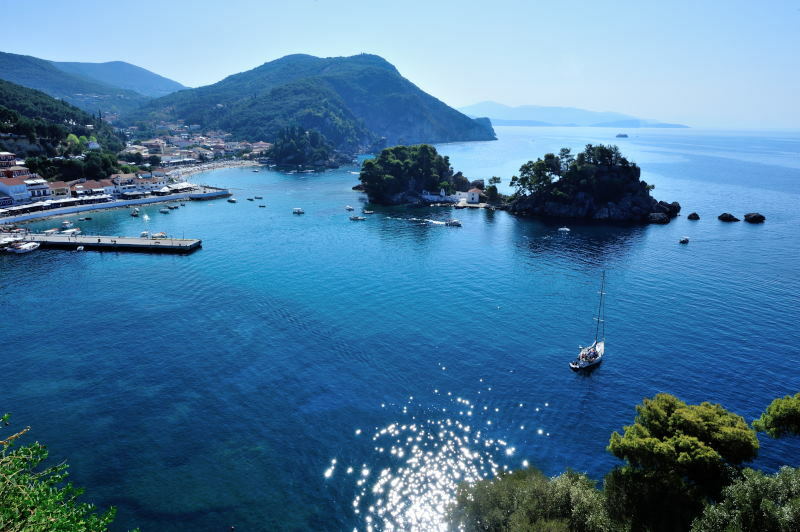 Parga is very much alive throughout the night and when the day breaks the peace will rule over the city. Sometime before noon, most of people will step out on streets for late brunch and one of the great places is Fresh Juice Bar ! In the cosy little coartyard, open to public upwinding stone paths , little boy-the owner’s son- will serve food and coffee to the guests. 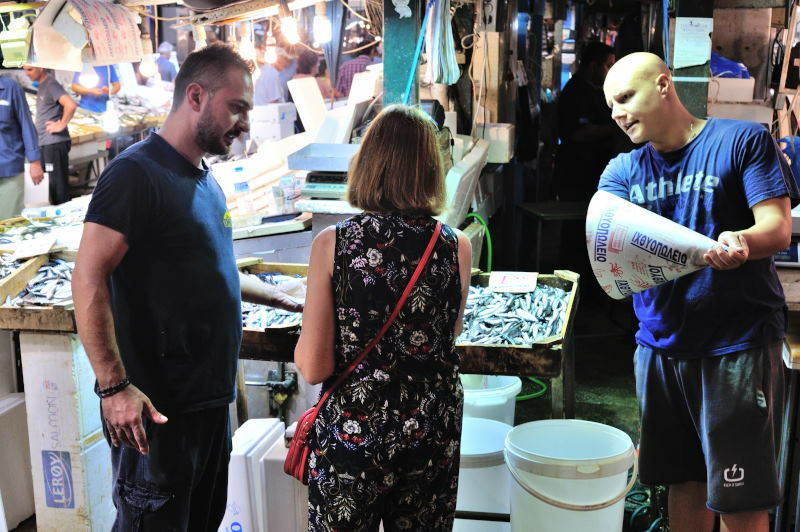 A restaurant close by invites everyone to “stop and check what Parga`s fishermen have caught every day” as there is a fresh fish at the docks every morning. 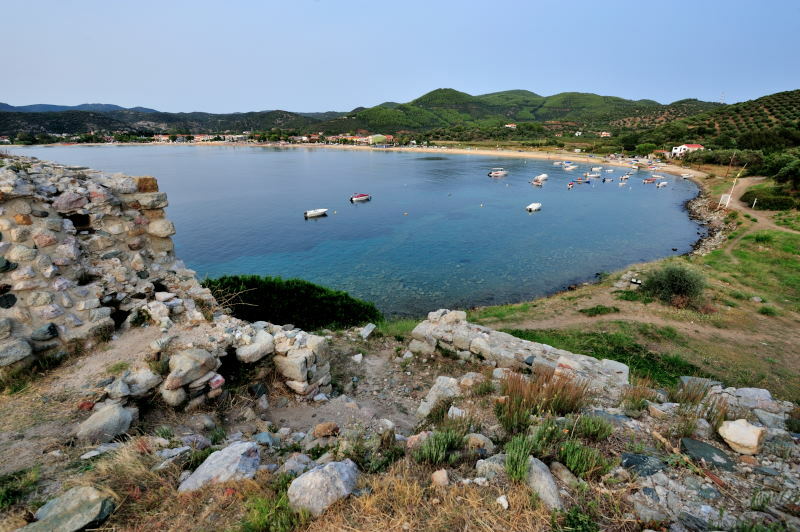 Further out, there are Valtos Beach and the old Venetian Castle, popular with tourists that like exploring the area before the heat spreads its wings over the town. Clear sea water is full of small fish and floating fishermen boats can be seen from the castle walls, tucked in a green hug of the surrounding forest. Fresh juice and breakfast, early bath at the beach and a walk to the castle – what a nice way to start the day! 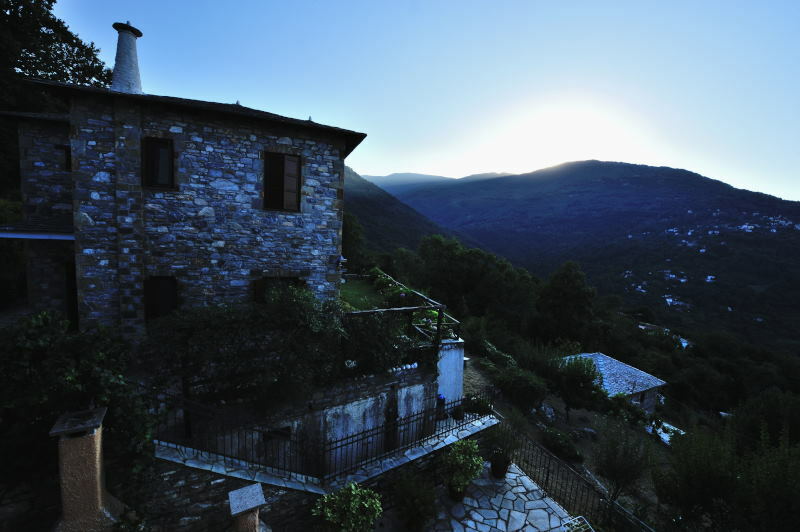 The day that maybe takes an adventurous spirit further south, to The Peloponnese. The penninsula is connected to the mainland by a beautiful white Rio–Antirrio Bridge. Crossing it feels more like passing under a huge fish skeleton, and after ten minutes of drive on land, the harsh sea waves will show themselves, splashing at the stones of the Fortress of Rion, built at the very end of 15th century. The waves rise high up, and anyone passing next to the fortress gate can actually get a nice splash in the face and their feet washed. That is the power of merciless and beautiful nature in its raw appearance! The Fortress has been through a lot, and has served both Ottomans and Venetians, whose cultures have left their marks on the building structure. Some areas can be so exposed to wind, that the trees bend and remain of changed shape. The view from one of the wall holes, that used to be windows back then, is absolutely stunning: the blue and white colours at their finest and strongest create something that might be described as “painted reality”. Because, whatever it is in front of the spectator`s eyes, it is moving, it is living, yet its beauty can only be compared to the state of the art of painting masters` brushes. And in the meantime, in the charming city of Patras not too far away, a wedding is getting prepared. 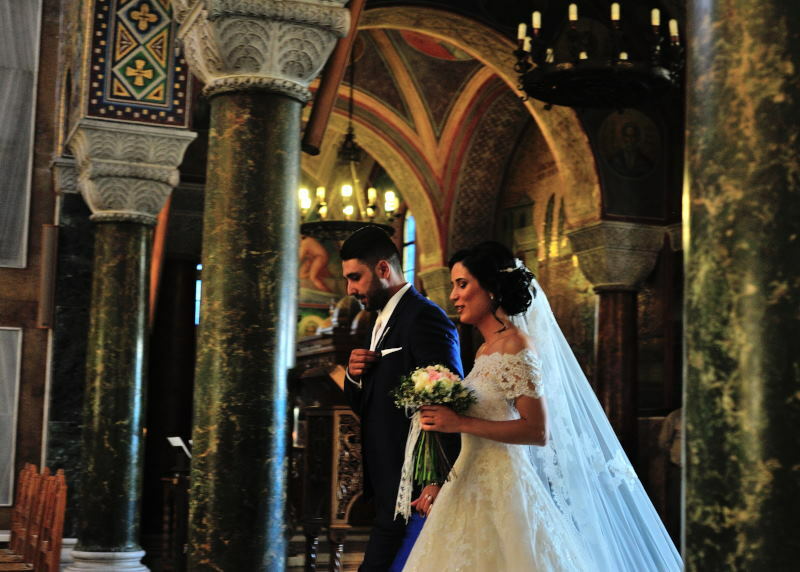 In the Saint Andrew Church, chairs and candles are being put up, and people are rushing in and out of the door to make sure everything is ready before the happy couple arrives. Saint Andrew is the patron saint of the city and the church is one of the sites not to be missed. Further walk, up and down the urban streets, leads to Georgiou I Square and a historical Apollon Theatre, said to resemble smaller version of the La Scala in Milan. No wonder Patras attracts so many young people and students to come and enjoy its atmosphere: the city is a real cultural and historical center of the area, and when the night comes, there are “new kids” hanging by the Agiou Nikolaou Stairs, laughing and perhaps talking about all that bothers them and that they dream about. It simply feels like that, when stepping down between all of them, babbling out through the night. When leaving Patras before noon on a warm summer day, the highway gets hotter and hotter with each passing mile; soon a sign warning of “HIGH RISK OF FIRE” appears. Forest fire is a “common danger”, which the Greeks should be aware of during summer months. When entering smaller land roads there are lines and lines of lime and lemon trees on both sides, and from time to time a small booth where farmers sell their honey, cheese and fruit. And in the distance – blue sea and huge grey mountain meeting each other, leaving an unforgettable image in the mind of the spectator. Nafplio on the east coast has a fully crowded beach by early afternoon. Yet, it is worth the effort; nature is lovely, from the stairs going through small pine tree park, where birds made their nests, and down towards the beach and water full of rich underwater life. 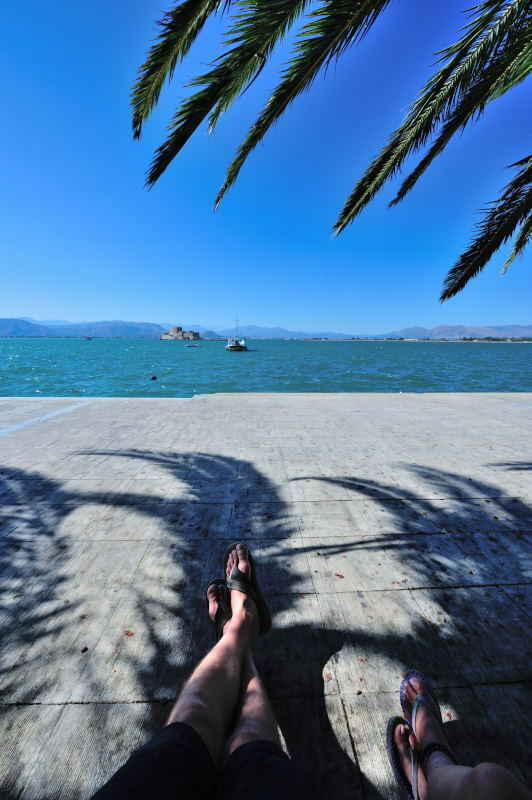 And better be active in water, as small fish in Nafplio bite those legs that just stand or float in the water!! 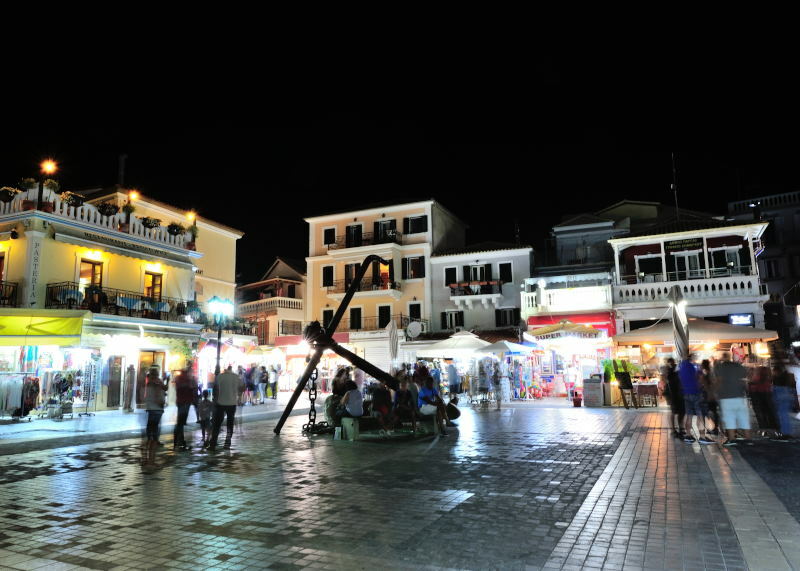 Nafplio is considered to be one of the nicest Greek towns and was the first capital back in the 19th century. The narrow streets in old cobblestone city center might be heaven for walkers, but absolutely not for those behind the wheel; the process of finding a misteriously hidden parking place includes wrong turns in one-way streets and bus drivers helping confused drivers by hand gesticulations. Sometimes, again, one can get lucky and find a nice spot, just left by another car, in shade of the palms. In the harbour, many domestic and foreign vessels are gently swaying and when the night falls, people are walking at the pier, taking photos of the poetic and romantic town and waiting for the boat show to start. Once the gondolas take tourists in, and the red flames are shoot up from the boats, the a capella choir will let the echo of powerful, beautiful voices fill up the air, flying over the water to the curious people crowd at the pier. 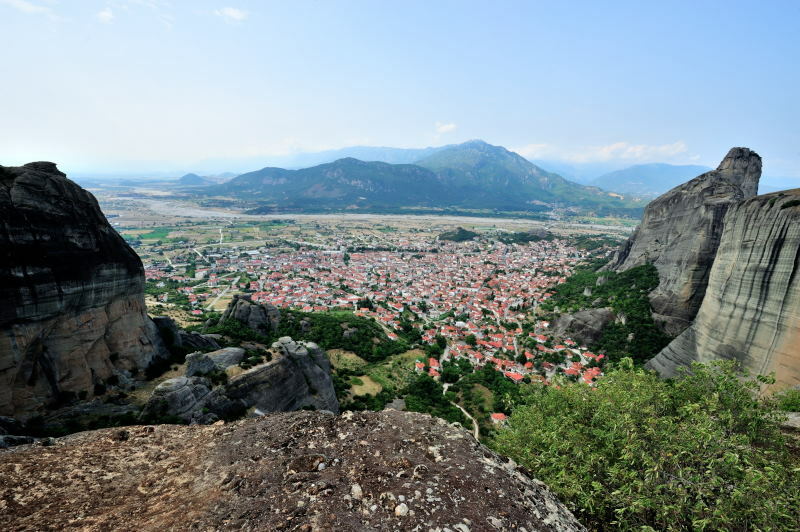 If it were not for way too hot mornings, climbing the 200 m hill to the 18th century Palamidi fortress would be pure enjoyment, crowned with spectatular view! Nevertheless, it still is for those who do not mind small sacrifices (heat, dehidration, sweat, fear of sunstroke?) – in the end, it often simply comes down to being fit to climb the hights in high temperatures. 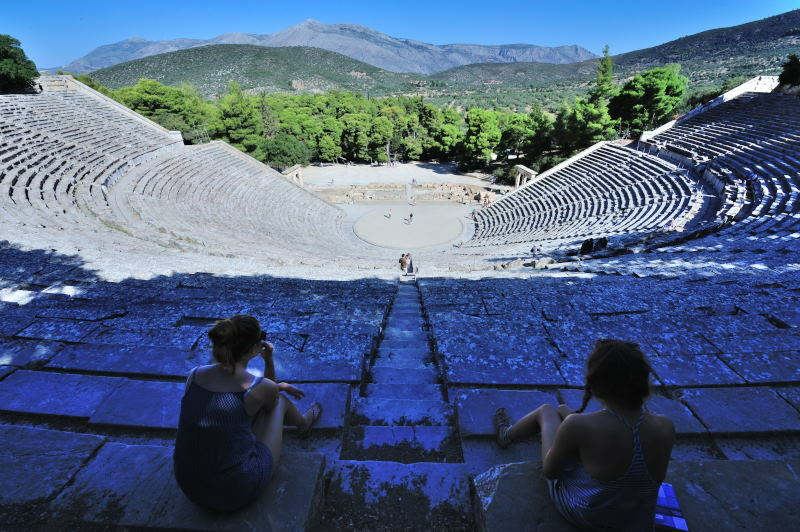 The Ancient Theatre of Epidaurus can also be very hot area to visit during the summer sunny days, but it is absolutely worth the visit at any time of the year, or day for that matter! Standing un the middle of the spectacular amphitheatre, trying to visualize how it felt for the ancient Greek performers, and even shout out some passionate phrases, is a unique experience. Or taking a walk down the spectator`s stone seats and clapping the hands to get the echo back at you. The excellent acoustics tells a lot about the skills of the ancient architecture masters. 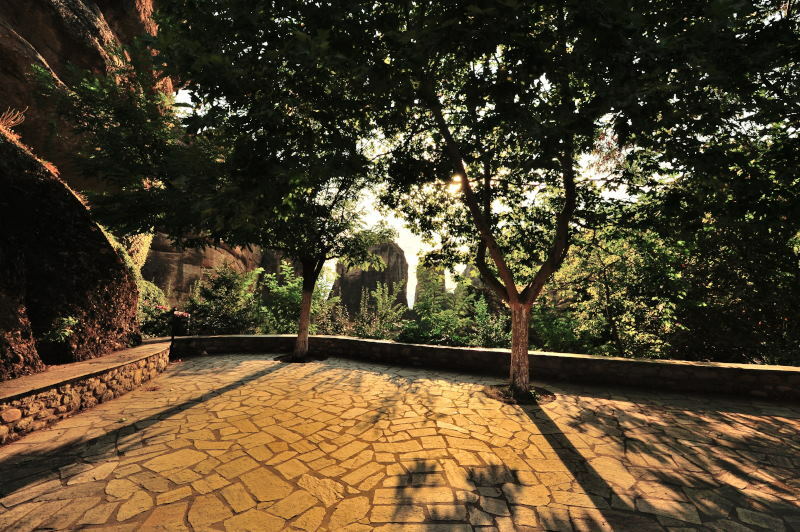 The whole area used to be the sanctuary dedicated to Asclepius, Greek god of medicine. There are the remains of the Temple of Asclepius, with ancient ornamented columns, writings and prescriptions, as well as written stories about magical healing that supposedly happened over night in this area. 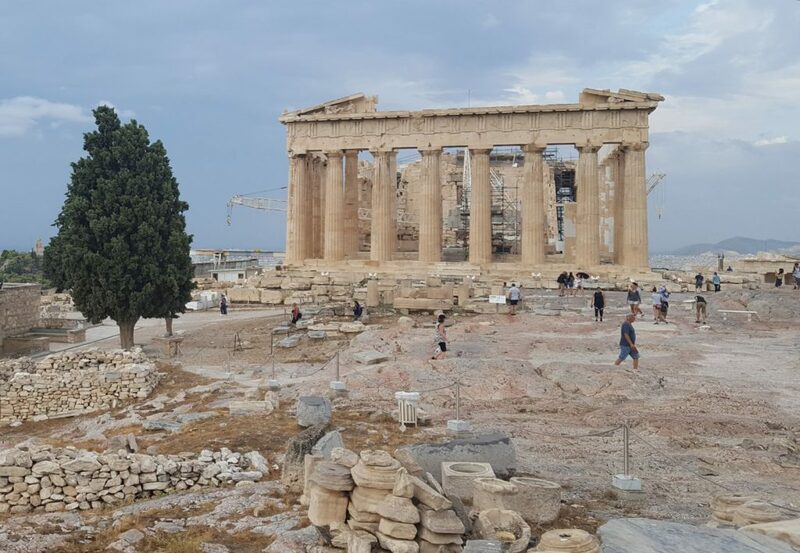 Not too far away from this ancient site, the highway leaves The Peloponnese and leads lines of cars into the modern Greece`s capital. 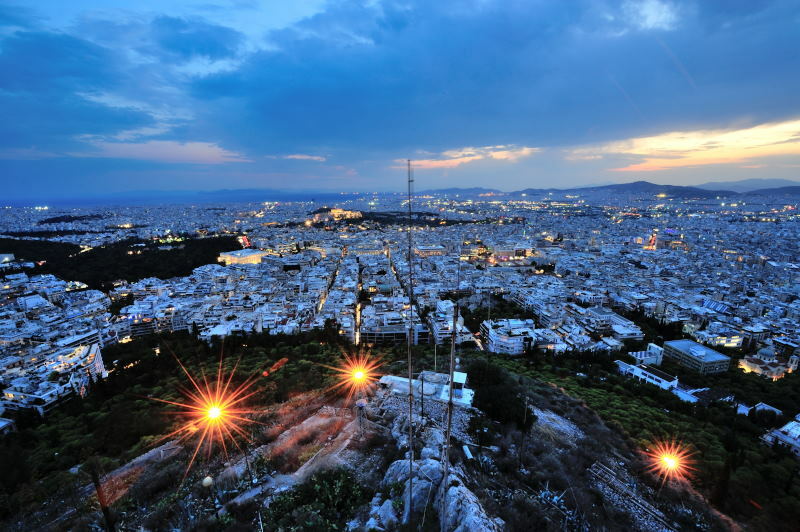 The modern streets in downtown Athens with fashionable stores and cafes is full of people, enjoying the city summer. While they are sitting in the shade during the hottest early afternoon hours, numerous street dogs are taking their nap, until the pleasant coolness lands down on the city. 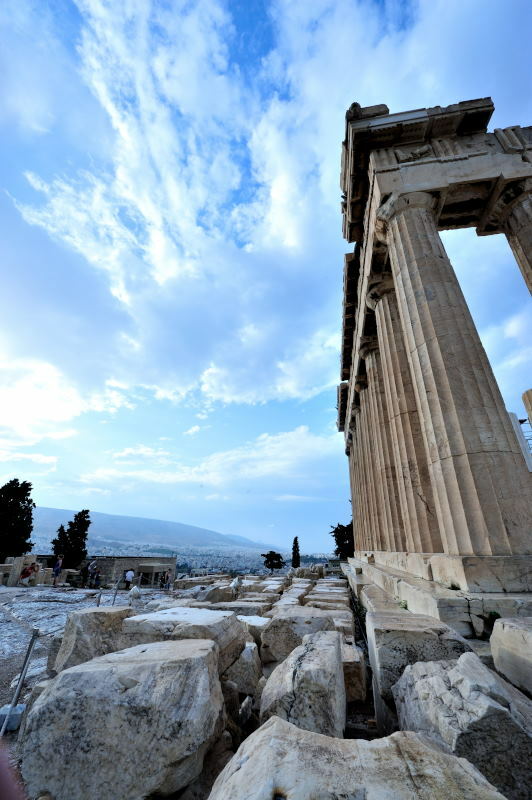 Athens, although fashionable and in constant change like many other European capitals, still keeps its treasures from the ancient times; goddess Athena probably still keeps its city, the sanctuary of Acropolis and the Parthenon temple, that people dedicated to her in 5th century BC. The hill is also rich with smaller sanctuaty sites in form of caves and monuments along the side slopes and not far away from it, small part left of Olympieion, columns dedicated to the god Zeus, remind of a huge site that used to be built here. The Pnyx, meeting place of Athenian democrats and orators, Ancient Agora or cozy and vivid neibourhood Plaka have also a story to tell about Greece in the ancient time. 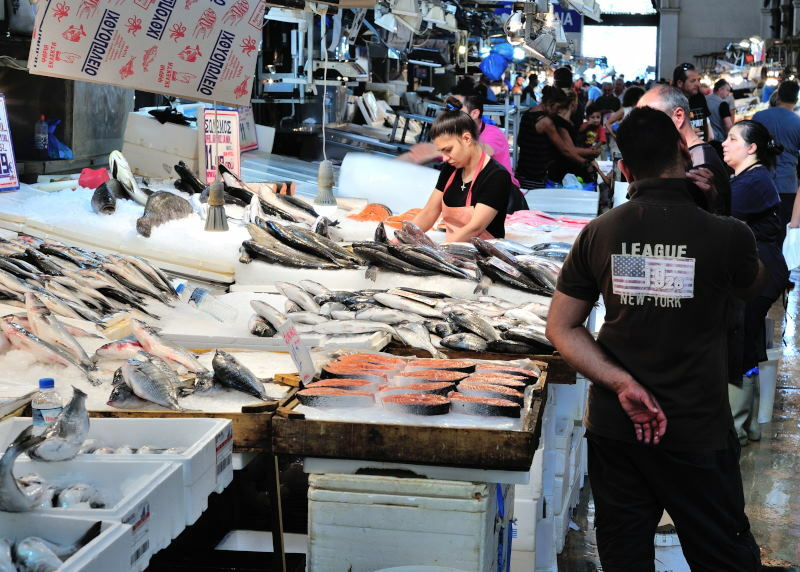 In the morning local fish market gets quickly crowded, as fishermen and sellers are elbowing through the crowd searching for some delicacy for lunch or dinner. 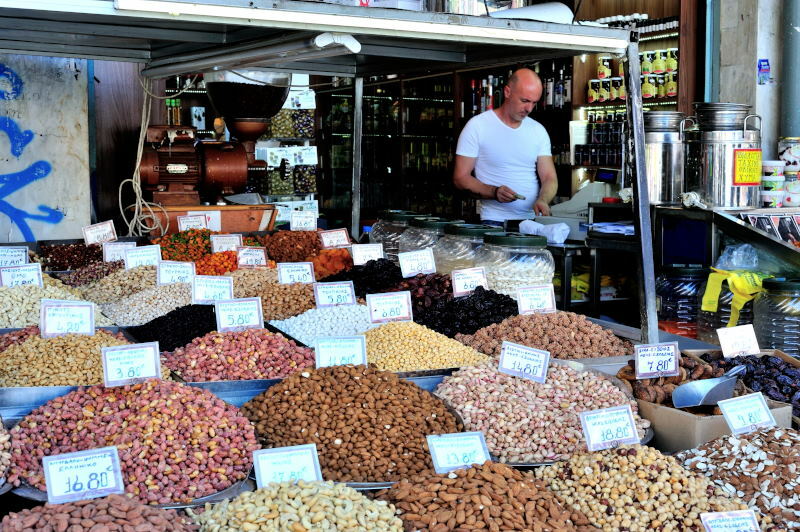 Outside, close to the street, there is an excellent choice of spices, vegetable and fruit. New day can thus start with a nice walk and shopping of the fresh goods. And how it will continue…it is hard to say, as there are so many different ways to enjoy the summer in Athens. 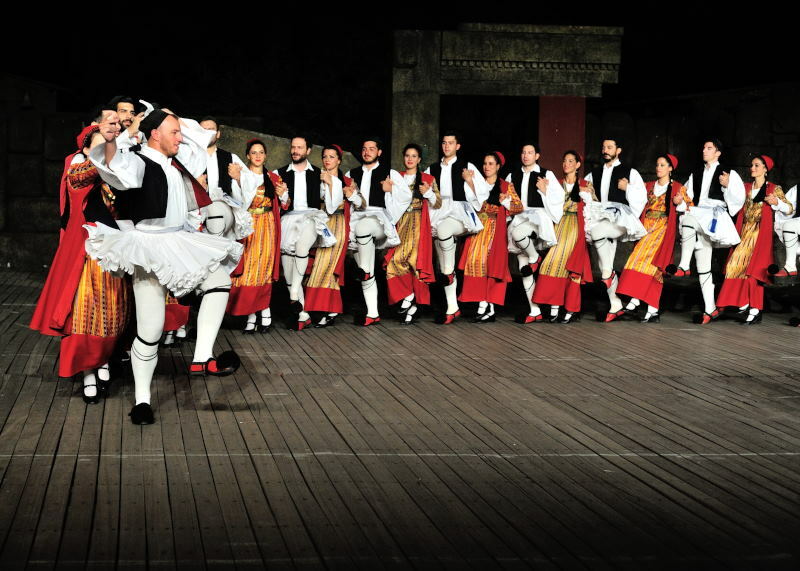 It might finish with a traditional folk dance, where both singers, players and of course dancers perform several styles of music and dance, from different part of this wonderful country. 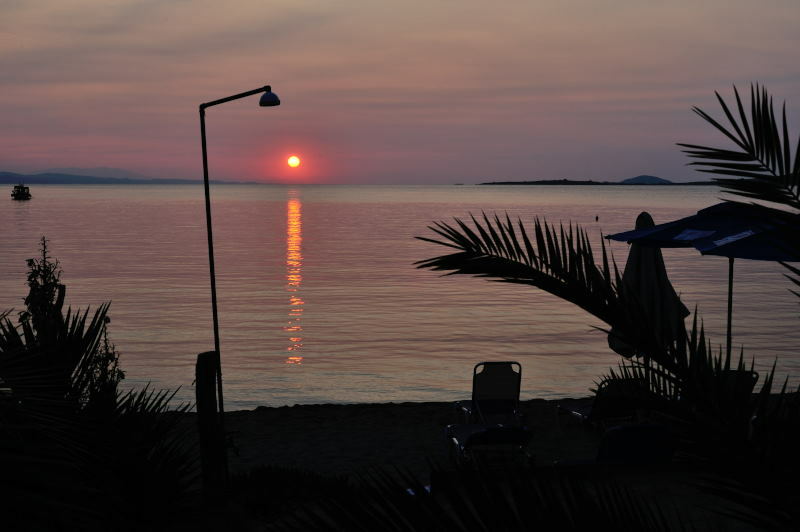 Yes, Greece, it is so easy to love you!